Emma is tired of being good. Always the dutiful daughter to an overprotective father, she is the antithesis of her mother -- whose name her dad won't even say out loud. That's why meeting Siobhan is the best thing that ever happened to her...and the most dangerous. Because Siobhan is fun and alluring and experienced and lives on the edge. In other words, she's everything Emma is not. And it may be more than Emma can handle. Because as intoxicating as her secret life may be, when Emma begins to make her own decisions, Siobhan starts to unravel. It's more than just Dylan, the boy who comes between them. Their high-stakes pacts are spinning out of control. Elaborate lies become second nature. Loyalties and boundaries are blurred. And it all comes to a head at the infamous Afterparty, where debauchery rages and an intense, inescapable confrontation ends in a plummet from the rooftop. This follow-up to Ann Redisch Stampler's Where It Began, reveals how those who know us best can hurt us most. “Was there supposed to be a moment of blinding clarity when the path through the thicket appeared, brightly illuminated, and Good, Bad, and Morally Neutral all sorted themselves out, slightly messy but completely unambiguous, like egg yolk and egg white and shell? Good girls don't usually kill their best friends. In her signature style, Ann Redisch Stampler does it again! She writes with such honesty, beauty and conviction, it is practically impossible to put this book down. Is it as good as her debut, Where It Began? Yes! Perhaps even a little better! Even more captivating, suspenseful and filled with so many feelings, you'll be mesmerized and addicted, and turning the pages like a Stampler junkie. In 2012, I gobbled down Where It Began. I instantly fell in love with Ann Stampler's vivid, powerful and emotionally loaded writing style. Afterparty sports a similar kind of liveliness and the same type of addicting narrative. Perhaps Emma is even more expressive and wordy than Gabby (Gabby's narrative tone was more sarcastic and biting, whereas Emma's is more poetic and contemplative), but I still had no trouble connecting with her (even if some of her musings were mind-blowingly abstract). If wordy prose isn't your cup of tea, you will probably shy away from this book, but if, like me, you enjoy getting to know your characters well and finding out how and what they think, you will have plenty of fun reading it. Emma was a very interesting, complex character. Seeing her break out of her protective shell and run wild was fascinating, even though from the sinister opening line of the book you are kind of expecting the worst to happen. I admired Emma for trying hard to stay in control of her own life. Both her father and her new best friend tried to mold her into someone she was not, but for the most part Emma stayed true to herself. She had a strong personality and she only grew stronger toward the end of the story. 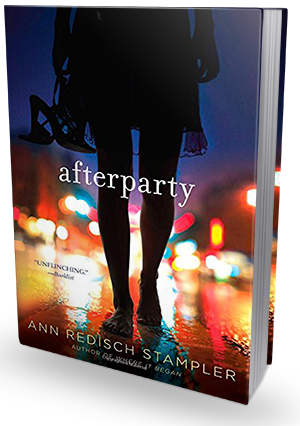 Afterparty is a compulsively readable contemporary fiction that blends high-intensity drama with romance and elements of thriller, creating an explosive, addictive and thoroughly captivating story. It's not perfect, it has its shortcomings, and not everyone will find the writing style to their liking for sure, but if you enjoyed Where It Began, I am sure you will love Afterparty just as much, if not more. Personally, I am a huge fan of Stampler's writing style. I can't get enough of it. And I really can't wait for her next book!